Your cubemap textures are really wonderful. I wonder how you create them : do you use any special equipment (except a digital camera) ? Do you use a fish-eye lens ? Do you use a tripod ? Is HDRShop a software you're using ? 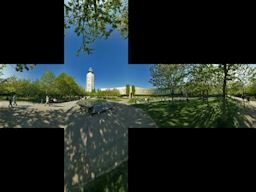 I've tried to create cubemap textures by first taking photos and creating a panoramic picture (with Autostitch, or Hugin), and then trying to convert it to a cubemap vertical cross texture, but it does not give a satisfying result (everything is distorded). I've done some research on Google to find good documents, but I didn't find anything interesting. Maybe have you some links ?